My thirty-second ground of 2017 was on Monday 4th December at Parkside in Aveley, Essex. The match was Aveley vs. Concord Rangers in the Essex Senior Cup 4th Round. Parkside was opened in August 2017 off the Aveley bypass on the western edge of the town. The ground is within sight of the M25 but is mostly surrounded by fields with Belhus Park leisure complex to the north the main neighbours. Parkside is around 3 miles north-east of the nearest railway station at Purfleet. 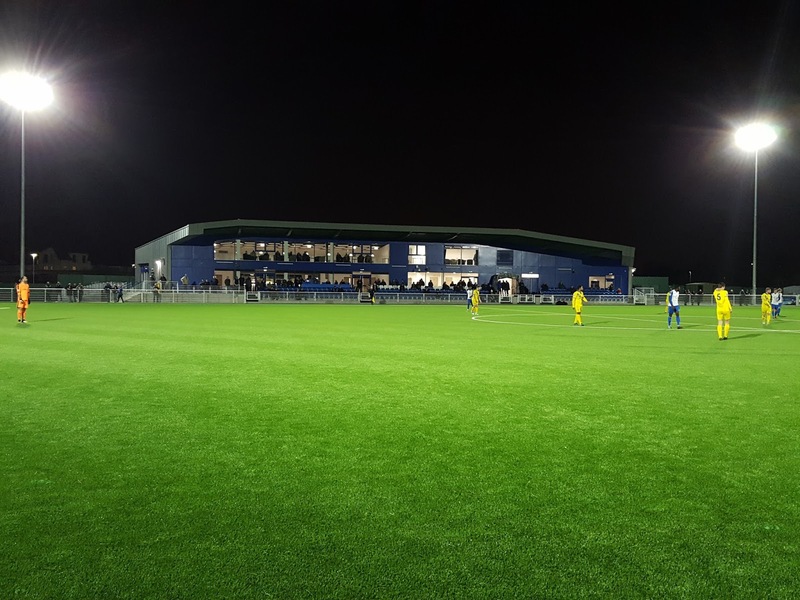 The venue became home to Aveley at the start of the 2017/18 season when they left their Mill Field ground where they had played since 1927. The western side of the ground has the main stand - a 2 storey structure which runs around half the length of the pitch. There are 257 seats across four rows of seating including press seating at the back. The seating starts on a raised platform which leads back to the clubhouse and one 74 seat section is kept separate from the rest to allow the players tunnel to exit onto the pitch. The clubhouse itself is known as the Parkside Suite and is a very smart building which includes a balcony level which overlooks the bar on one side and the pitch on the other. Along from this on the top level is the boardroom. The club reception is through the bar and leads to a large car park and heading back towards the pitch there is a food outlet. Either side of the stand are uncovered standing areas. The other seating area is opposite the main stand - the all-seater stand on the eastern side of the ground has room for 152 spectators and the two dugouts are either side of this. There are a pair of small covered metal terrace stands either side of the goals at both ends. This takes the total number of stands to six with the rest of the ground uncovered standing. 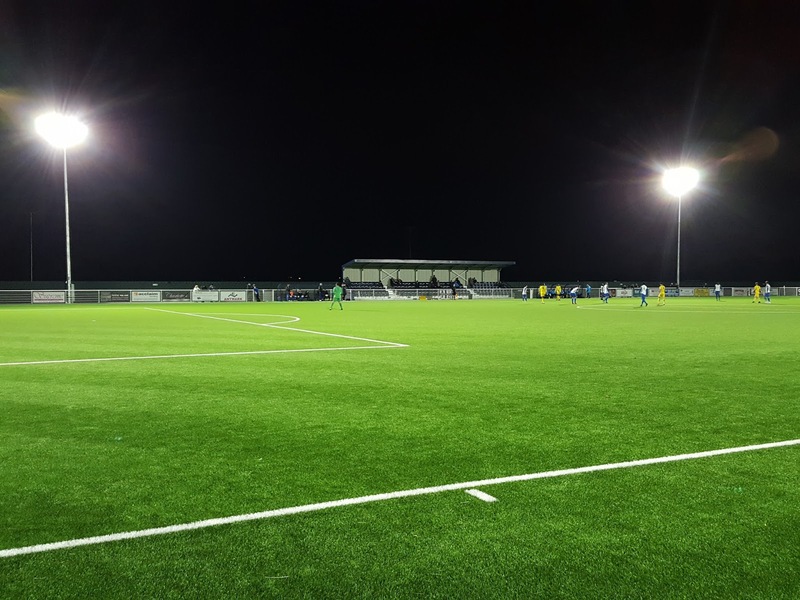 The standing areas are all tarmac with no natural grass at the venue - the only grass is the 4G pitch placed atop the tarmac surface underneath. 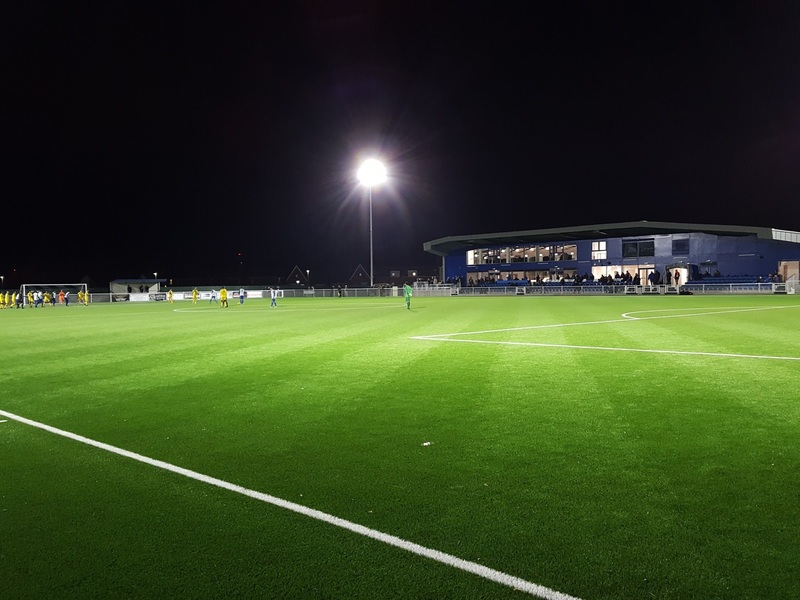 The game was between Isthmian League North Division side Aveley and National League South side Concord Rangers. The hosts had a good chance to go ahead in the 6th minute when Sewa Marah crossed into the six-yard box for Jack West who brushed the side of the post with his header. From the goal kick the ball was sent up the other end of the pitch and found Concord's Femi Akinwande. As he went into the area a mistimed tackle by Alex Stephenson sent him over and a penalty was awarded. Steve Cawley went to the keeper's right but Rhys Madden in the home goal got down and palmed it away to avoid an early setback. In the 18th minute Aveley went close again when a ball from the back caught out the visitors and left Jordan Watson one-on-one with Louis Wells. However his shot was straight at Wells and the chance came to nothing. The rest of the half was fairly quiet with Conord having the upper hand but their shots were usually high and wide. The home side's best spell came in the opening ten minutes of the second half culminating in Alex Teniola's rasping half-volley from 20 yards which brought a good save out of Wells. A minute later the visitors grabbed the first goal of the match when Khale da Costa got on the right side of the area and pulled back for Steve Cawley to slot low to Madden's left. From this point Concord never looked back and would grab another four goals over the next twenty minutes. The higher league side notched goal number two in the 64th minute as Kyron Farrell's mazy run drew the home defence allowing him to pass to the free Akinwande to shot into the bottom corner. 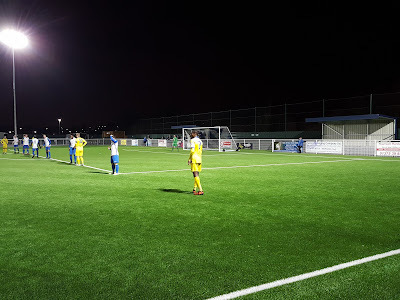 In the 70th minute Aveley had a lucky escape when Steve King's looping header was cleared off the line but within 60 seconds it was 3-0 anyway. Khale da Costa had a great run in on goal, showed neat footwork to beat the last defender before smashing in at the near post. Five minutes after this Billy Roast headed in a corner from a couple of yards out and in the 78th minute Concord were awarded their second spot-kick of the match for a chance to make it 5-0. Again it was Akinwande who drew the foul, this time from George Woodward, and he picked up the ball and dispatched the kick low to the keeper's left. Fortunately for Aveley this was the end of the scoring, though Steve King should have made it 6-0 when he missed an open goal with a header. In the end Concord's quality shone through in the final third of the match but the 5-0 scoreline was rather harsh on Aveley who had been a decent match for the opening hour of the tie.